ATTENTION! 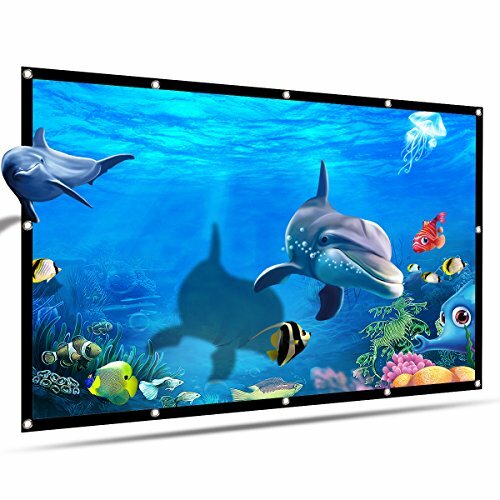 Here you'll find the best way to enjoy your multimedia videos with your projector screen! Fed up watching your favorite games or movies on a small screen? Are you lazy to mount the screen because it is very laborious and tedious? Tired of having to watch TV inside your house, not enjoying your patio or garden? Are you embarrassed to invite your friends or relatives because you think you will not offer them the best visual experience possible? Introducing your very own 120 Inch Portable Projector Screen to the rescue! The bigger the better. We give you 120 reasons to enjoy your favorite movies, series or games next to yours. Do not worry about compatibility. It is universally suitable for all LED, LCD or DLP and laser light projectors on the market. The image quality you deserve. The screen is ready to project in Full HD, HD Ready, 4K, and 3D. Indoors and Outdoors. Take it allways with you and convert your living room, bedroom, garage, door or backyard in a hd cinema with you projector screen. Feel secure with your purchase! When you order today, you're protected by our 30 DAY NO-QUESTIONS-ASKED MONEY BACK GUARANTEE and our fabulous customer service. We are a family-run business and we give 100% to each one of our unique customers. Press ADD TO CART with confidence! So let the show begin and enjoy your favorite projection, because soon you will have your very own OWLENZ Foldable Projector Screen to make it as real as life!